We carry a wide variety of coin, stamp, and baseball card supplies that dates back to fifty years. Some of the most popular supplies are 2×2 coin holders, plastic sleeves, coin tubes, magnifying glasses, and cleaning products. We offer Whitman and Dansco blue and brown coin collecting books. We have state quarter, national park quarter and presidential dollar collecting books and kits. We have stamp supplies including but not limited to hinges, glassines, catalogs and mounts. We carry price guides for coins, stamps, paper money and cards. Chances are if we don’t have it, we can order it in for you! Herbs Coin Shop carries a large inventory of coin supplies to cater to both coin collectors and sellers. Our inventory includes albums, books, folders, pages, sheets, cases, boxes, tubes, holders, flips, cleaning solutions, tools, and more. Want to know the current value and price of your coin collection? Herb carries the latest red book, a reliable source to check values and prices of coins. Red book has over 400 plus pages of information and has been the standard price guide for sixty plus years. The Standard Catalog of World Coins as the name implies is the yardstick for World coins. We carry books from the year 1600 to the present. Customers can purchase individual books or buy sets for additional savings. We carry books from other publishes as well. Herbs Coin Shop carries both major album brands Dansco and Whitman. Dansco albums are by far the most widely used albums due to their versatility in the coin industry. Dansco brand on the other hand has a lesser number of album titles to choose from. Whitman coin books are frequently used as an affordable introduction to coin collecting. Whitman coin folders are one of the most popular and inexpensive ways to organize and display a coin collection. Coin folders open flat for all-at-once viewing then close to a book size for easy storage. Each coin folder includes mintage figures and coin collecting data. 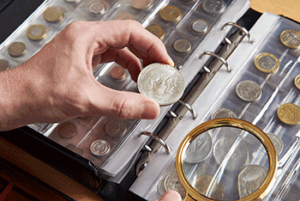 Pages are an economical way to organize, store and transport your coin inventory. They can be added to your album, as the inventory grows. Pages are designed to carry standard coin holders. Herb offers a variety of three ring pages to choose from based on the size of holders needed, the number of pockets on each page, and the material the pages are made of. We carry both the thicker Cowens brand and the Guardhouse brand 2”x2” cardboard frame coin holders. Each 2”x2” coin holder holds a single coin and has a polyester window in the center to view both sides of the coin. Although the 2×2 coin holders are the most common size, we also carry the 1.5 holders and 2.5 coin holders. Coin flips are made from plastic and have two pockets, one to hold the coin and the other to hold a piece of card board to write a short description. The most common size is the 2.5-inch flip but we do carry other sizes as well. Coin flips are best used for storing coins and not for displaying them. These are made with rigid plastic such as polystyrene. Since plastic holders are made to house a specific size of coin, it provides additional protection. Plastic holders come in many options. We carry both the Harris brand round tubes and Coinsafe brand square tubes. Each tube is made of the highest quality plastic for durability. Tubes can be purchased individually or in 100 tube boxes. Latter provides greater savings. Capitol brand coin holders are a leader in the industry of producing coin holders that are safe, secure and also great for showcasing your coins. Among others, we carry the most popular classic three panel, screw mounted holder. Capitol coin holders come in 2”x2” to hold individual coins to 12”x12” to hold coin sets. Harris trademark is a leading brand in the numismatic field. We carry Harris brand coin albums, binders, pages and other accessories. We also carry supplements for Harris Albums. We regularly stock supplements for the Liberty US, Statesman Worldwide, and Plate Block Albums. The standard page size for all supplements is 9”x12”. Herb’s Coin Shop carries all basic supplies required to start a hobby or a profession in stamp collecting. We stock books, albums, protectors, storage, mounts stock pages, hinges, magnifiers, gauges, and more. Scott Mounts are ideal for keeping moisture and dust particles away from your stamps. They come in a variety of sizes to choose from and are made from 100% polystyrol foil. We also carry the Prinz brand mounts. We often do not know the release dates for supplements until Scott announces them. Once they are released, we will make them available at our store. Customers are encouraged to call us to check availability. We carry several brands of stamp hinges including Prinz. Our hinges are of finest quality and made to last. Packages come in varying sizes with 1000 hinge packs being the most common size. Glassine is a semi-transparent envelope used to safely store your valuable stamps. Glassine envelopes are pH neutral therefore archival quality. We carry several brands and sizes including the common Westvaco 2 7/8” x 1 ¾” envelop. We also carry price catalogs for a variety of products. Please call us to check what we have in stock. Whether you are a hobbyist collecting baseball cards for leisure or a serious collector making a living from it, we have you covered with all the baseball card supplies you need. Below is a listing of most commonly requested items. Don’t see what you are looking for? Come visit us at our shop for a total inventory of supplies. We carry all leading brand plastic card sleeves including Ultra Pro brand. All our sleeves provide long-term protection and are archival safe. They are also acid free and won’t yellow or crack. Therefore, they maintain the crystal clear finish. We carry card sleeves for single cards as well as card sets. A range of sizes is also available to choose from. If you are looking for more protection for your trading card than a card sleeve, the rigid top loader is a good choice. Although the Ultra Pro 3×4 is the standard, we have several other competing brands to choose from. Herb also carries Top Loaders varying in color and thickness. Here is a choice for premium protection of your valued baseball card collection. Screw-down holders are even more rigid than the Top Loaders. Herb carries both the one screw-down type and the four screw-down types. We carry Pro-Mold, and other leading brands at Herb’s Coin Shop. The signed baseball of your favorite star can be protected from exterior elements with in one of our several baseball holder displays. All our displays are made with high clarity, UV safe, premium quality acrylic. We carry holders that can accommodate one to five standard size baseballs. We carry storage boxes for both trading cards and gaming cards. Each box is made with high quality material and comes in varying sizes to hold between 100 to 1000 cards. Interior of all boxes are yellowish brown and the exterior is white. The larger boxes come in two pieces, a lid and the container. Looking for the value of your vintage baseball card? Herb carries Becketts, the world’s most trusted online database for trading cards. We also carry printed price guides such as the Standard Catalog of Baseball Cards and others. 8:00am - 4:00pm Mon,Tue, & Thur. Wed, Fri, & Sun. - Closed.